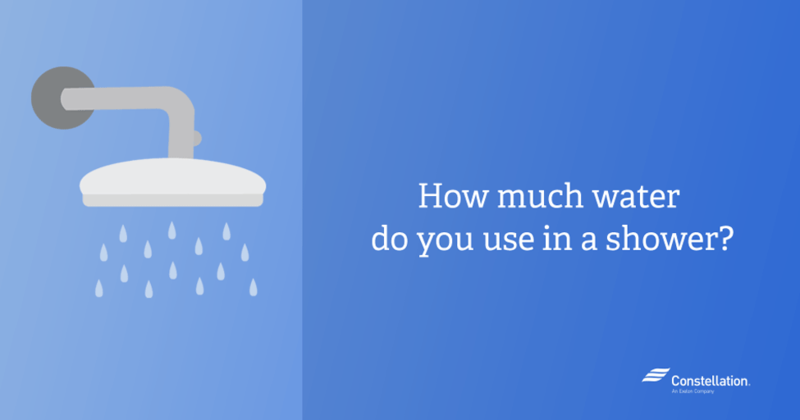 How much water do you use in a shower? Some people see showers as a utilitarian invention: It’s an easy way to remove the dirt of the day without the hassle of filling a bathtub. For others, the shower washes off far more than grime: it can be a happy, private space, where some people escape reality and wash away the day’s annoyances, whether it’s an irritating boss or family members who constantly need something. No surprises here— the latter take longer showers, with the former often left fuming in front of the locked bathroom door. These two very different mindsets can cause arguments. But if information is power, we’ve decided to arm you with the facts you need to make your best pitch for why your shower water usage is exactly the right amount. Home Water Works says that in most homes, showers are the third-largest user of water after toilets and clothes washers. The average American shower water usage is 17.2 gallons with the average shower length being 8.2 minutes. The average flow rate is 2.1 gallons per minute. Here’s where this shower water usage can add up, however. Most Americans take just under one shower a day. For the sake of figuring out the potential impact of our shower energy consumption, let’s call it six showers a week. At 17 gallons an average 8-minute shower, that’s 102 gallons of water used in a shower by one person for one week. Multiply that by 52 weeks, and you’ve got a whopping shower water usage of 5,304 gallons in a year for one person or 21,216 gallons for a family of four. And that’s assuming every shower is only 8 minutes long. How much does it cost to run a shower? A number of variables affect shower energy consumption costs: the efficiency of your hot water heater, the temperature setting, whether or not your hot water heater is powered by gas or electricity, its size (30 vs. 40 gallons, for instance), and, of course, the price of a gallon of water. Water heating is the second largest energy expense in the average home, accounting for about 18% of your energy bill after heating and cooling, Energy.gov says — that’s in part because of the average shower. Length does matter. We’ll start with the easy math. The average price of water in the U.S. is about $1.50 for 1,000 gallons or less than one cent per gallon. That means the cost of the water is also less than one cent for the average shower length of eight minutes. To determine exact shower energy consumption, try the Energy.gov calculator that lets you plug in the model of your hot water heater and other specific factors. Combine this with your shower water usage and you’ve got your total cost. Here are some other suggestions for reducing your shower water usage. Take shorter showers. Even shortening a shower by one minute can save gallons of shower water usage as well as the heating costs associated with showering. Install a low-flow showerhead. Energy.gov recommends using showerheads with flow rates of less than 2.5 gallons per minute. You can choose between aerating showerheads (which mix air with water to create a misty spray) or laminar-flow showerheads, which form individual water streams. If you have any fixtures that predate 1992, replace them. Showerheads from that time had flow rates of 5.5 gallons per minute. 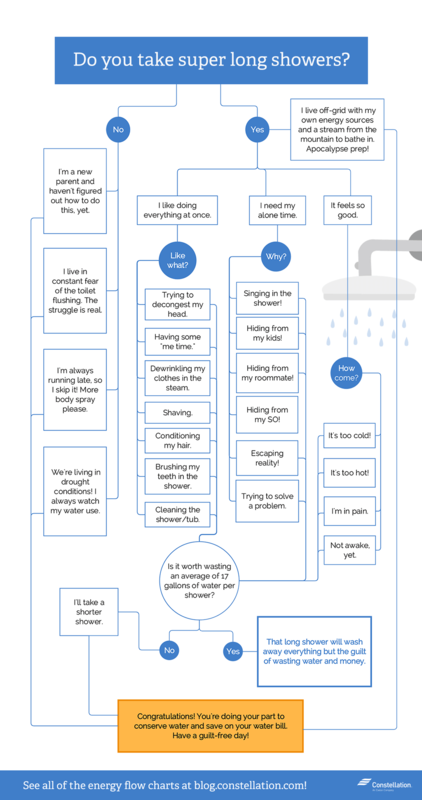 Not sure of your showerhead’s flow rate? Try this: place a bucket marked in gallon increments under your showerhead. Turn on the shower and time how many seconds it takes to fill the bucket to the one-gallon mark. If it takes fewer than 20 seconds, you could reduce your shower water usage by installing a low-flow showerhead. Take a “Navy” shower. You can reduce your shower water usage by turning off the water while you shampoo and lather up. Home Water Works estimates you can reduce your average shower length impact by as much as five minutes using this technique also known as a combat or military shower. You’ve learned all about shower energy consumption. Get the details on saving energy on lighting, thermostats, and laundry, too. Check out our Energy Hacks video on shower energy tips, too. So much agree with you. We all need to save water. Thanks for the infographic. Hi Caroline, we agree! Thanks so much for the support.